Written Inc. spent 10 years developing a proprietary technique, known as Written Body Language Analysis(TM), which taps into the salesperson’s subconscious mind to reveal their true personality traits. This method helps salespeople become aware of traits they didn’t know they possessed. Other personality assessments currently on the market ask the salesperson to answer questions about themselves. This approach only reports the perception they have of themselves, which is often very different from reality. Plus questionnaire based assessments only reveal broad personality types such as “dominant extrovert” which has limited benefits to the salesperson. Salesperson Insight helps salespeople and sales managers of all experience levels and industries. Sales trainers can also use the sales personality report with their clients to increase effectiveness of training and improve results. 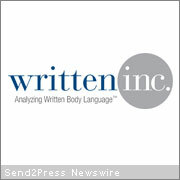 To learn more about Salesperson Insight, visit http://www.WrittenInc.com or call +1-888-670-6702.